RIDGE AND VALLEY BEEF - WHERE CAN I FIND IT? Honestly, we’ve been pretty quiet on here since first started our website and opening a blog. Since then, we’ve largely been feeling out the marketplace and doing some experiments with deliveries, cooking, whole animal butchery, and delivering our meat to a handful of restaurants. When the business first started in 2014, we felt like we had a pretty good handle on the whole business. We didn’t. You see, it’s more than just producing beef. It’s producing a product that you believe in. You believe in it because it’s good...and it’s yours...and you know it’s good, because you did the best job you could possibly do. It’s taken years for us to dial in our product. It has been a journey to say the least...but today, I can say with full confidence that our product will rival any beef you can purchase anywhere. This past week, I helped cut up some of the finest beef I have ever tasted. And you know what, it was ours. The rich white marbling coupled with tenderness you could cut with a spoon - it was really, really, good. It’s taken persistence, a strong will to succeed, and lots and lots of research, trial, and of course, error. You can’t expect quality results when you’re inputs are mediocre, at best. It just doesn’t work. But when your inputs are the best on the market, your results reflect those inputs. Makes sense, right? The picture to the right is a freshly cut rib-eye. 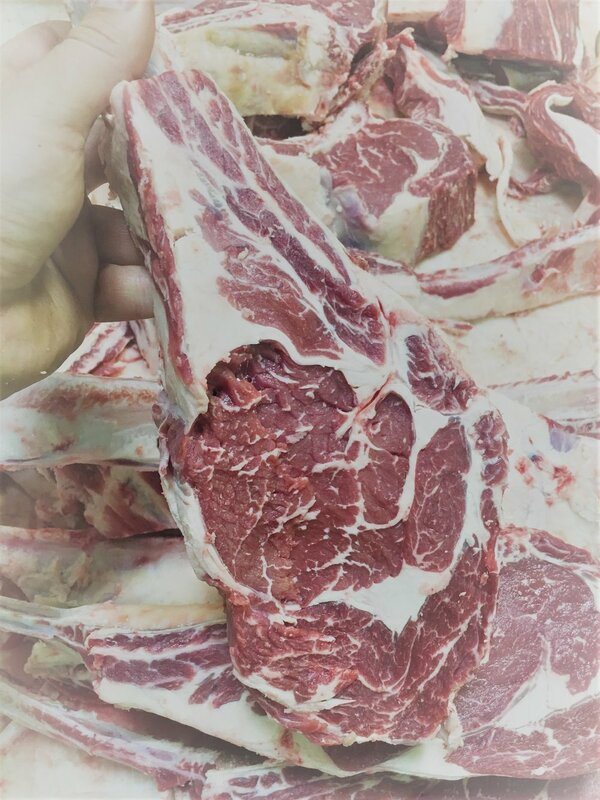 It’s a prime example of premium quality beef - well-developed white marbling, a curvy and robust shape, and not too big and not too little. If you’re familiar with choosing a superior steak based on looks, this picture speaks a thousand words to you.